The Mercedes-Benz A200 comes with a long list of safety and tech features. FIRST impressions are everything when it comes to prestige. 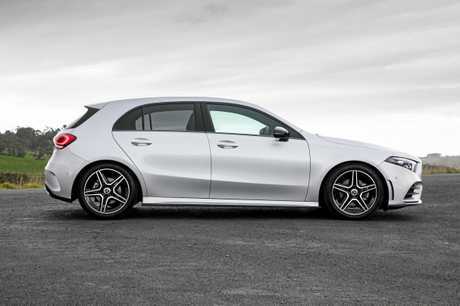 When it comes to the Mercedes-Benz A-Class it's love at first sight. For those entering the premium world that romance starts with the grille - primarily the badge on the front. But take a seat within this hatch and Cupid's arrow hits you fairly between the eyes that'll have you cooing "Hey Mercedes”. And when you do, the A-Class responds ... it marks the beginning of a beautiful relationship. Called the Mercedes-Benz User Experience, it learns where you like to go, who you call along with your driving set-up preferences, and can even change the aircon temperature when you say "I'm cold”. This class-leading technology comes standard in the new pint-sized Benz that's stacked with cool kit and starts with an on-road cost of about $50,000. Befitting the price tag is a first-class cabin. Two 10.25-inch colour screens dominate attention, along with the turbine-looking air vents and the combination of chrome and black finishes. The view is intoxicating. Past entry-level offerings have been bereft of premium trimmings - essentially your investment is in the first 20cm of the car - not this new A-Class. As a pathway to the brand it's likely to inspire long-term customers. The Benz User Experience (MBUX) is standard (smartphone mirroring apps Apple CarPlay and Android Auto are only complimentary on the A250), along with keyless start, wireless charging for compatible phones, man-made leather trim, sport seats, satnav, 18-inch alloys and tinted glass. There is also a 10-speaker sound system with a subwoofer. 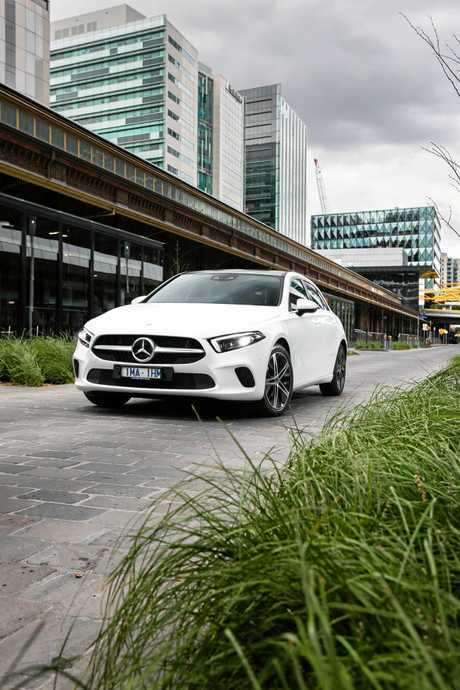 Despite downsizing the engine, Benz's new 1.3-litre 120kW turbocharged four-cylinder engine pumps out more power and torque than the drivetrain it replaces. Serviceable and honest, the acceleration is linear and responsive but the overall experience is acceptable without setting new standards. The ride can be firm, courtesy of the run-flat tyres, and it doesn't carve up the bends like a hot hatch. Yet that's not the remit of this A-Class model. It's all about function, fashion and technology - and it ticks those boxes with aplomb. Around town it's superbly nimble with the light steering making easy work of tight carparks. 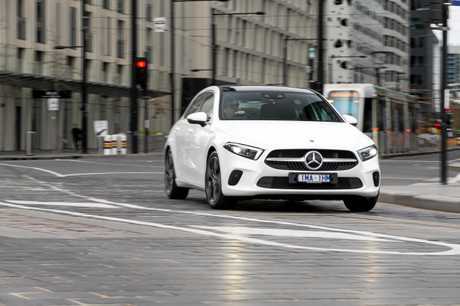 Those wanting more punch can opt for the freshly minted A250 all-wheel drive with a 2.0-litre turbocharged four-cylinder engine, pumping out 165kW and 350Nm. 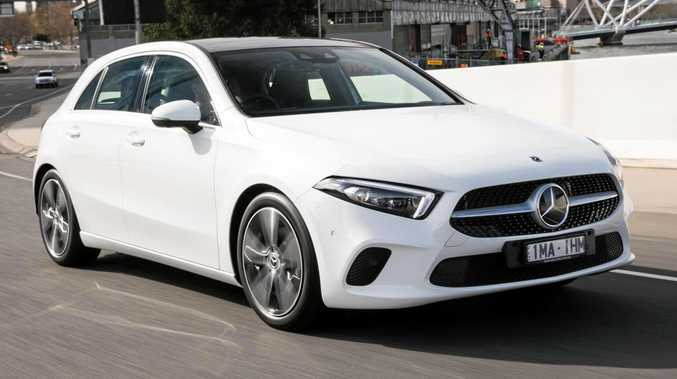 Expect a base A180 early next year followed by a sedan before June. Using the technology can be confronting at first, but master the two touchpads on the steering wheel and things become intuitive. It's the first time Mercedes has used a touchscreen (where you can swipe and pinch like a smartphone) and combine that with the touchpads and it's simple to navigate through various menus and options. MBUX takes time to learn user profiles, but after a few weeks it provides suggestions to offer easier access to the applications you use most. Like your favourite radio stations, who you phone at certain times, or fastest way to places you visit regularly. When you say "Hey Mercedes, I'm cold” it will increase the cabin temperature. Which is where it takes higher ground against using Apple CarPlay or Android Auto. Interior space has also been improved on this model, and our family of four had no issues with reasonable leg and knee room for those in the back. 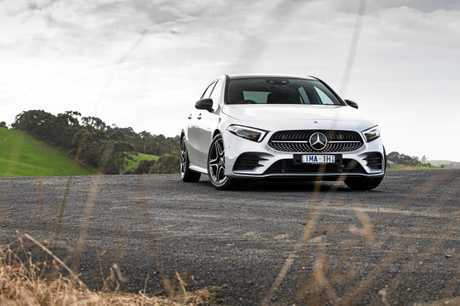 Local crash testing awarded five stars, with ANCAP reporting the A-Class achieved the highest vulnerable road user protection rating to date with a score of 92 per cent, and has equalled the highest child occupant protection rating, scoring 91per cent. Helping gain the maximum star rating are nine airbags, fatigue monitoring, active lane keeping which can steer the vehicle back between the lines if the driver wanders, automatic high beam and emergency braking which can automatically apply the brakes if the driver doesn't react quickly enough. The latter doesn't work when reversing. On the options list is radar cruise control that maintains a set distance from vehicles in front, great for those who make regular highway journeys. While there is a cheaper 3-cyl Beemer, this 184kW/290Nm 2.0-litre derivative is more closely aligned in specification. The 120i trails in looks and technology but is quicker and a better drive. 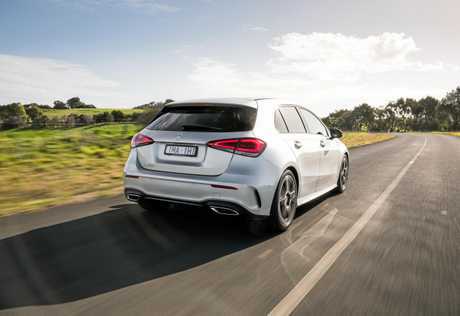 Also trailing the Mercedes-Benz in cabin technology and space, it raises the bar by pumping out a handy 192kW/250Nm from its 1.8-litre 4-cyl. One of the most accomplished sports hatchbacks on the road, with a 180kW 2.0-litre turbo/seven-speed twin-clutch transmission. Setting a new standard of interior and safety technology, the A-Class is a modern marvel. Those wanting seat-of-the-pants driving thrills may be disappointed, but those searching for prestige, good looks and class-leading functionality will have their minds blown.